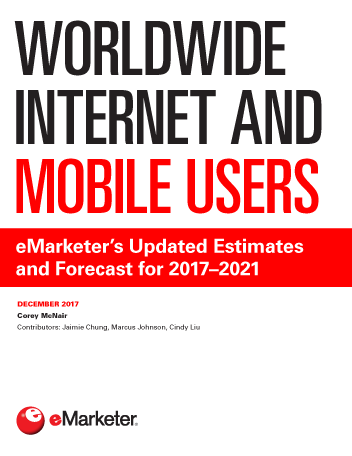 Internet user growth will continue to slow through the forecast period, falling from 6.1% in 2017 to 3.5% by 2021, as internet use reaches saturation in several countries. By 2019, more than half of the world will access the internet regularly. In 2021, more than 4 billion people will be online. Developing digital markets in Asia-Pacific, Latin America and the Middle East and Africa will see the fastest internet user growth throughout the forecast. Gains will be driven by widening mobile broadband coverage and smartphone adoption (smartphones are typically the entry point for internet access). The number of mobile phone internet users worldwide will reach 2.73 billion this year. Of that group, 87.4% will use a smartphone for mobile internet access. Though smartphone user growth will slow to a single-digit rate by 2018, Asia-Pacific and the Middle East and Africa will outpace the worldwide average throughout the forecast. In 2017, for the first time, tablet penetration among internet users worldwide will decline. About 32.9% of internet users worldwide will access a tablet this year, down slightly from 33.2% in 2016. While the number of tablet users will grow 5.2% in 2017, this trails internet user growth by roughly 1 percentage point. eMarketer expects the tablet user base will climb from 1.14 billion this year to just 1.28 billion by 2021. "In 2017, 2.73 billion people worldwide will use a mobile phone to connect to the internet, representing 36.9% of the global population and 78.9% of internet users."